He is the President of the United Arab Emirates. SHARJAH: A large number of Pakistanis from different segments of society attended a gathering on Friday night to celebrate the UAE National Day in which a dedicated website was introduced and invited the community to express their loyalty towards the UAE and its Rulers. The programme was organised by founders and members of Pak-UAE Friendship Forum, including Advocate Muhammad Raees Qureshi, Prince Iqbal Goraya, Muneer Hans and others. “Besides the celebration of National Day of UAE, the event was also marked to honour chief executive Dr Abdullah Al Shaibani of http://www.ourallegiancetokhalifa.ae, a website launched recently to provide opportunity to people to express their appreciation towards the UAE and its Rulers who made the country a remarkable place for everyone,” said Qureshi. He said we are asking our community to come forward and through this website join the people around the world to share their comments and appreciate the visionary leadership of UAE Rulers. “The portal was launched in Abu Dhabi in May and has been receiving entries from various expat communities and we are sure that the Pakistani community will show their loyality towards President His Highness Sheikh Khalifa Bin Zayed Al Nahyan and Members of the Supreme Council of the UAE for their contribution to make the country a home for people around the world,” he added. He further said people belonging to different nationalities and religions reside in the UAE with happiness and love the country. “It’s a unique platform that is treating everyone equally and people should lodge their commitment on this website,” he said, adding that the New Year will bring more peace and prosperity to everyone. Dr Abdullah Al Shaibani said that people around the aglobe showed tremendous appreciation, recognition and loyalty to President Sheikh Khalifa. “So far around 10 million people have visited the website, including a large number of Pakistanis who shared their comments on the website to appreciate the UAE and the Rulers,” he added. Abdul Qauum Khugani, Counsellor (Passport) at the Pakistan Consulate, Dubai, also attended the programme and said that the UAE National Day is an important day for the Pakistani community as both countries are very close and always stand by each other. “We Pakistanis consider the UAE as our second home where other nationalities live in harmony,” he said. Boxing Mohammed Sand (in Black) from Emirates in action against Ahmed Lembarki from Tunisa during the Arab Boxing Peace Championships at Tennis Stadium, Al Garhoud. Hamham held off Rukhsana Khal, her challenger from Pakistan in the lone women’s bout, Mahjoob outboxed his Cambodian challenger Thor Shan in the lightweight 60kg category, while Whelan ousted a gutsy Denzil Diaz from Spain after nine gruelling rounds in the Middle Weight 70kg division. Frenchman Yohan Bonsour was the lone champion who failed to defend his belt after the judges decreed that Raul Denenbourg, his challenger from The Netherlands had enjoyed the better share in the nine-round bout. The bout between Whelan and Diaz was one of the more engrossing fights as the smaller-made Spaniard matched his opponent’s reach through sheer speed and ability to stay away. However as the fight progressed, Whelan started taking control as he punished Diaz with a barrage of punches to his face in the eighth round. With both fighters struggling for breath, the ninth and final round was as good as a formality. “My plan was to listen to my coach’s [Charlie Peters] instructions carefully and implement them. He [Diaz] is a very experienced opponent and I had to make sure I didn’t get within striking range of his right,” he added. After improving his record to 35 wins from 54 fights, Whelan will now take a break till his managing team narrows down on an opponent in early 2015. “It would be lovely to be back in Dubai and have the opportunity to defend my belt. But then that is in the future. Right now I am only looking forward to a well-deserved break,” Whelan said. The boxing championship was held to convey the message of peace and fraternity among all and the fight card consisted of seven bouts of which four were professional title defence fights and the remaining three involved amateurs. Earlier in the amateur fights, the UAE’s Mohammad Sanad gave the holiday crowd much to cheer about when he defeated Ahmad Mubaraki of Tunisia in the 70kg category. In the other two fights, Georgio Alessi won by technical knock-out (TKO) over Libya’s Mohammad Nabeel and Jordan’s Saif Zagzouk secured a close win over Christian Mmboea of Cameroon. Archeological excavations and antiques found in many areas of the country have proved that a great civilization used to be prosperous in the area known today as the United Arab Emirates. The civilization is dated back to 4000 BC , and was interrelated with the neighboring civilizations . Sheikh Zayed bin Sultan Al Nahyan was born in 1918 . In 1946 , he was elected ruler of Al Ain and in 1966 , he became ruler of Abu Dhabi. In 1968 , Britain declared its withdrawal from the area . Immediately Sheikh Zayed took the lead in calling for a federation of the emirates . The rulers of the other emirates moved quickly and on the 2nd of December 1971 the United Arab Emirates formally emerged onto the international stage . On November 2nd 2004 , Sheikh Zayed passed away , after a long journey of giving and achievements . The nation keeps going on his vision under the leadership of H.H Sheikh Khalifa bin Zayed Al Nahyan , President of United Arab Emirates and his brothers , the members of the Supreme Council and Rulers , and their crown princes . The United Arab Emirates, or UAE is bordered by the Arab Gulf from the North, Gulf of Oman and the Sultanate of Oman from the East, the Kingdom of Saudi Arabia and the Sultanate of Oman from the South, and the State of Qatar and the Kingdom of Saudi Arabia from the West. The country is located between 22-26.5 N latitude, and 51-56.51 E longitude. The United Arab Emirates has a 644 kilometre long coast south of the Arab Gulf, where the Emirates of Abu Dhabi, Dubai, Sharjah, Ajman , Umm Al Quwain and Ras Al Khaimah are located, while the 90 kilometre long coast of the Emirate of Fujairah is located at the Gulf of Oman. The area of the country is 83,600 square kilometers, with the desert dominating most of this area with many popular oases. Most of the country’s coast is dominated by sand except for the northern area at Ras Al Khaimah which constitutes the Hajer mountain cape. The country has hundreds of islands within the Gulf, of which 200 are in the Emirate of Abu Dhabi, importantly Sir Bani Yas which has evolved into an oasis and a conservation area for endangered and rare birds and animals. The UAE has a population of 8.19 million and is continuing to grow at a rapid rate despite the global downturn; according to a comprehensive report on the country's economy, unveiled in May 2010. Our Website "Allegiance to Khalifa" is the first virtual site designed to show appreciation, recognition and loyalty to His Highness Sheikh Khalifa bin Zayed Al Nahyan , President of the United Arab Emirates , for his continuous contributions and accomplishments in boosting the UAE’s social and economic welfare on the regional as well as on the international level . His Highness Sheikh Khalifa bin Zayed Al Nahyan gives extraordinary care for the citizens in terms of providing them with the basic needs : adequate housing , healthcare and free education , as well as embracing safety and security and care for citizens , residents and expatriates in the United Arab Emirates . Your registration and participation in this charter is a message for spreading the culture of peace and peaceful coexistence, that is embraced by the United Arab Emirates under its faithful Rulers . The charter will be presented to H.H. Sheikh Khalifa bin Zayed Al-Nahyan , the President of United Arab Emirates . The Founders of the United Arab Emirates headed by H.H. Sheikh Zayed bin Sultan Al Nahyan and his brother H.H. Sheikh Rashid bin Saeed Al Maktoum - may Allah have mercy upon them - and their brothers the Rulers of the other Emirates , whose footsteps were followed by all successors under the leadership of H.H. 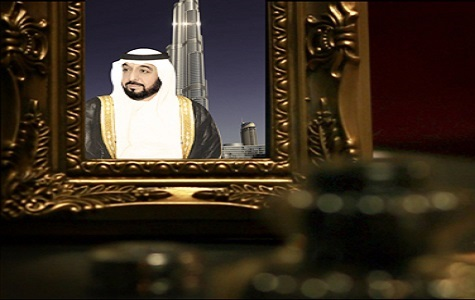 Sheikh Khalifa Bin Zayed Al Nahyan and his brother H.H. Sheikh Mohamed bin Rashid Al Maktoum , and their brothers , the members of the Supreme Council of the Union , these founders have formed a unique and flawless model for unity , which has been particularly characterized by the peaceful civilized coexistence in the United Arab Emirates. This Charter aims at achieving a global peace based on the model of the United Arab Emirates as an example for the whole world , in peaceful coexistence , with love , security and respect amongst all nationalities , religions and beliefs .